ABOVE: Erlach Castle, Bielersee (Lake Biel/Bienne). The bilingual city of Biel/Bienne makes a fine jumping-off point for cruises on the Bielersee (Lac de Bienne), Lac de Neuchâtel, and the Murtensee (Lac de Morat). Swiss lake steamers ply a variety of routes. The main sailing season is June through September, with some boats running on a limited schedule from early April until late October. Not all boats stop at every village along the way, so check schedules carefully if you intend to disembark between major ports. Most boats carry a limited number of bicycles for a small fee. Some of the boats on this route go only to St. Petersinsel (see next paragraph), but most finish their journey at Erlach. (See photo above.) The Bielersee is a relatively small lake with beaches on the southern shore, wine villages on the northern hillsides, and walking paths that make it easy to combine boat travel with leisurely hikes. If you're a bird and wildlife buff, allow time for a visit to the nature preserve of St. Petersinsel or �le St-Pierre (St. Peter's Island). You can visit the restored inn (a former monastery) where Jean-Jacques Rousseau took a break from civilization for two months in 1765. In summer only, a boat leaves Biel/Bienne at 9:45 a.m. and arrives at Murten/Morat at 1 p.m. The next leg of the itinerary departs Murten/Morat to Neuchâtel at 2:30 p.m, arriving in Neuchâtel (the largest town in the region) at 3:45 p.m. After a 10-minute stop in Neuch�tel, the boat returns to Biel/Bienne, arriving at 6:20 p.m.
An audioguide is available at extra cost. Depending on the season, boats leave Biel/Bienne two or three times a day--except on Mondays, which is the shipping company's day off. A 16th Century old town and a bilingual culture enliven a city that Rolex, Omega, and Swatch call home. The capital of Canton Neuchâtel (a mostly French-speaking canton) is also a watchmaking center. 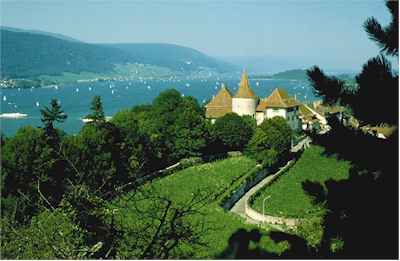 It has an attractive medieval center and an attractive location on Lake Neuchâtel.